Twidlit can be downloaded from https://github.com/pushkarkp/twidlit/releases/download/v1.0.2/Twidlit.jar (you'll need Java too, of course). The source code is at https://github.com/pushkarkp/twidlit if you'd like to play with it --- perhaps you'd like to port it to Android. Practice chording without committing to a chord mapping or even a hand. Twidlit prompts for random (thumb-less) chords as chord patterns, not keystrokes. Collect statistics on how long each chord takes. Twidlit retains the times of the last 16 presses of every chord (by each hand). List the chords in order of speed. Twidlit uses the interquartile mean to derive a robust measure, and lists the chords in a text file. Count the frequencies of characters, bigrams and specified ngrams in source code and other text files. Twidlit accumulates counts from individual files and whole source trees. List characters in order of frequency. Twidlit lists the characters with their counts in a text file. Create chord mappings from chord and keystroke lists. 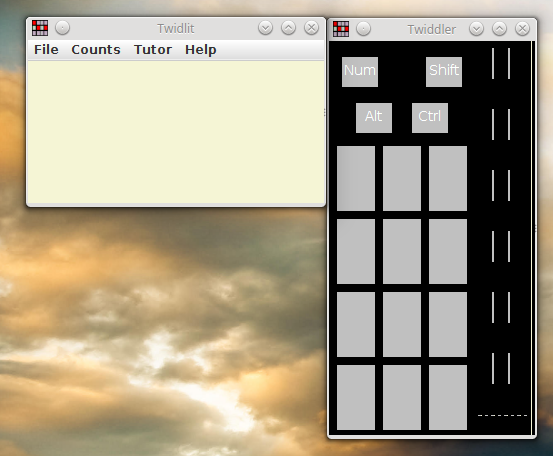 Twidlit combines sorted lists of chords and keystrokes (with an optional existing incomplete mapping file). Read, write and display chord mappings. Twidlit can read and write them as text or binary (.cfg). Practice chording with a chord mapping. Twidlit prompts for keystrokes selected at random from a practice file, supplying the chord pattern answer if required after a specified delay. Give it a whirl. Questions and suggestions are welcome, here or at 4twidlit@gmail.com. This sounds like an awesome resource! I'm not sure I have it really working correctly though. I ran it (on Linux, with java -version giving 1.8.0_91). something - There are red squares flashing in the window and the File->All Chords ... menu option becomes available - but the latter only shows the default layout, not the one I just opened. Actually, it seems it does load my cfg file, it's just not displayed with the file->All Chords. I see the correct suggestions when trying the "Keystrokes" tutor. Cool! The "Chords" tutor still doesn't make sense to me though ... but I suspect this is the "practice chording without committing to a mapping" feature. If so, it's a nice idea, but it might be a good idea to have some text inform about it in the window, it's pretty confusing UI-wise. Thanks for being first at the bleeding edge. You seem to be making reasonable progress unassisted, but you are right, there is not much guidance in the UI. Have you read any Help? The Reference page is intended to help with what you are doing now. I'll have a look at the crash tonight. If you delete twidlit.name.keys Twidlit should open correctly again. If necessary delete all the twidlit. * files. Why were you trying to load that file? It is already loaded automatically. You don't need to touch it unless you want to change the key names. Hi, yes I read the instructions, their inclusion is appreciated! It is a lot of text though, and having just a short text in the text window to introduce just what one's seeing in the graphical window would make a lot of difference - maybe something like "this does this and that, press any key to start", or "hit the chords before time runs out" in the graphical window - things like that. The same is tor the "Counts" files - they are described in the reference, but it would help if the file dialogue showed a short line describing just what file it wants and on what it's for. I don't remember just why I tried to load the file, I was just trying around different options to test the stability of the program. Also, for some reason my folder (not the jar archive) was full of files before (I didn't clone the git repo). Now, after deleting all and re-downloading there is only the jar archive and a twidlit.properties file. Not sure what the difference was. One thing, when choosing the "keystrokes" tutor, it prompts for a file. If you don't give it one, it will give you the alphabet - which is fine, but it wants the alphabet capitalized. Due to how shift works on the twiddler, I would suggest that it would be better to start out without having to worry about the thumb. It's also a bit strange that your own keyboard layout is not remembered between runs - even if I quit the program safely, it's back at the default layout and I have to find my own .cfg file again. If not saving it outright, maybe a "Recent layouts" submenu might be an idea. Such a great harvest of issues! It's taken me a while to get on top of them. Here's where I'm up to. "my folder was full of files": You must have pressed "Preferences... > OK" to get all those files. It is safe to delete them. "it will give you the alphabet": I'm not a fan of the thumb buttons either. It actually listed both upper and lower case. I've taken out the upper case. I've updated the link in message 1 of this topic. I think I've covered most of your issues. Cool, I'll take it for a spin soon, thanks for your work! So with the official Tuner unresponsive I tested updating my config with Twidlit. Ran into some problems. Save As - try to save as a new twiddler .cfg file - this crashes with this traceback. Is there some other procedure for editing one's config file? I've fixed the issue in 4, but I'm having trouble reproducing the crash. Can you put the file somewhere I can reach it? Thanks. The idea is to keep any config you are working on as a text file. That way you can give it a name that distinguishes it from any others you have, and easily check what the mappings are. You only need to save it as binary when you deploy it on the Twiddler. don't worry about the data, I've reproduced it. I tried reverting to 1.0.1 and that (still) starts fine. That's interesting. I wrote Twidlit to be Java 7 compliant, but compiled that jar on a machine with 8 installed. I won't do that again. With it you can modify Twiddler 3 settings (why wasn't that in there ages ago?) and assess map files against your chord times and keystroke frequencies.